Possibly a cast copper alloy fragment from a two-part handle from a drinking vessel (probably a tankard) of probable post medieval date (cAD1600 to 1800). The fragment consists only of the thumb rest. One end is a square based straight sided flat plate with two holes with the broken copper alloy rivets still in place. Above this, along the straight top edge, is the groove for the thumb rest bar. The piece then has a sub-rectangular flat tab with convex curved outer sides and corners which narrow in the centre of the outer edge to form a rounded knop. In the centre of the thumb rest bar are the initials R J P with a foliate design along the outer edge. The fragment has a yellow/brown patina on both sides apart from the metal on the reverse of the rivets which is corroded. The piece measures 28.73mm in length, 14.04mm in width, 2.76mm in thickness and weighs 2.78g. 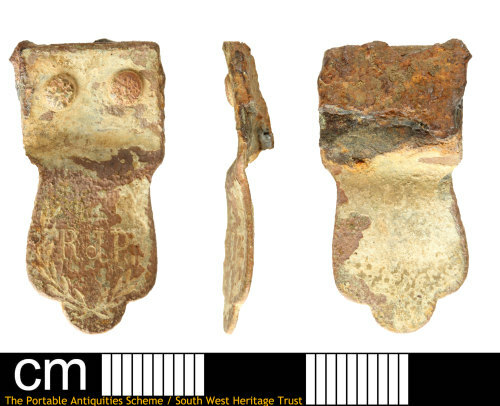 Thumb rests for tankards with flip top lids with similar double rivets through the attachment but very different tabs are recorded on the Portable Antiquities Scheme database, for example, see WMID-65AA06. It is likely this had a similar function but was later, dating to around the 19th century.